Warren Burrell hit a sensational hat-trick from centre-half to fire Harrogate Town to victory over Aldershot at the CNG Stadium. 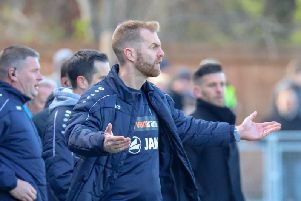 Not for the first time in recent weeks, Simon Weaver's men found themselves trailing following a slow start, though they ran out comfortable winners in the end and moved to within four points of the National League summit. The struggling Shots hadn't tasted success in six matches prior to Saturday's long trip north, though they began the afternoon brightly and were ahead in the 14th minute, notching for the first time in five league outings. Lively left-winger Luke Wanadio was given two bites of the cherry and his second cross from close to the left byline fell for Adam McDonnell to ram a strike home. Town had struggled to string more than a couple of passes together prior to falling behind, but they showed signs of life when George Thomson's low free-kick forced a decent stop out of visiting gloveman Will Mannion. A swift counter-attack then saw Gerry McDonagh race through on goal at the other end of the field, and the pacy striker's delicate chip looked destined for the back of the Harrogate net, however James Belshaw sprung majestically and clawed the ball to safety. Another Thomson free-kick drew a second important save from Mannion at his near post, before a third Town set-piece led to parity being restored. This time it was Joe Leesley who delivered the free-kick, his ball to the far stick met by Callum Howe, nodding across goal towards the lurking Dominic Knowles. His close-ranger header was somehow kept out, but Burrell was on hand to smash in a 32nd-minute equaliser. Buoyed by their goal, Town finished the opening period in the ascendancy, though Thomson's off-target 20-yarder was as close as they came before the interval. Weaver's men began the second period sloppily, gifting Shots substitute Matt McClure the chance to run down the centre of the pitch and send a left-footer just past Belshaw's right-hand post. The hosts soon settled back into their rhythm and got their noses in front with 54 minutes on the clock. Leesley curled an inviting, in-swinging corner over from the right and Burrell was at it again, getting there first and heading home at the near post. Though Town continued to threaten, their visitors rallied briefly and Josh Barrett could have tied things up at 2-2 only to lash high and wide when unmarked and in plenty of space inside the Harrogate penalty area. That was about as good as it got for the Shots, however, as Burrell wrapped up the points and completed his own treble in the 70th minute, stooping to nod in another Leesley set-piece that was begging to be finished. Jack Muldoon then headed wide and substitute Aaron Williams fired just too high in the closing stages, but there was still time for a fourth of the afternoon. The away defence seemed to evaporate and Belshaw's long ball over the top was controlled neatly by top-scorer Muldoon, who found himself one-on-one with Mannion and confidently bent his 10th of the season into the top corner of the net.